February 4, 2011 by Laurie 38 Comments This post may contain affiliate links, which means if you click on a link and purchase something, I may earn a small commission (at no additional cost to you.) See my disclosure policy HERE. Amazon has a pretty sweet deal on Huggies Diapers right now! 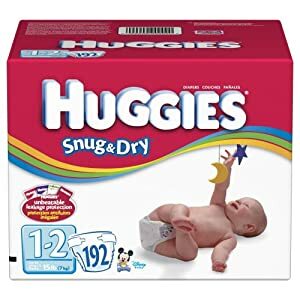 Get a box of Huggies Snug & Dry Diapers, Size 1-2, 192-Count or Huggies Snug & Dry Diapers, Size 4, 140-Count for as little as $21.45 when you use your Amazon Mom Account and choose to Subscribe and Save! Amazon's price comes out to as little as $.11 per diaper, which is less than any of the top diaper deals this week using coupons. Plus they're shipped directly to your door without tax! Go HERE and choose which size diapers your little one needs. thank u just got a box of size 1-2 for $5.55 after using a $10 off abd 20% off coupon from amazon thanks so much!!! Thanks for posting this! I used a 20% coupon from Baby Talk magazine AND my $20 credit (that cost me $10 last week from Living Social so I paid exactly NOTHING for a big box of diapers. Thanks for the heads up! du…I forgot to sign up for the “subscribe and save”. The Size 4 I only found them for $33. something. I was able to use 2 20% off coupons and had the $20 gift card I bought for $10 so maybe I done ok but could have done better if I would have remembered that 1 step “subscribe and save”. Goodness! Thanks for sharing. Can you enter a paper coupon into the Amazon check-out site for the Huggies diapers? BTW, thanks for the deal post! Is it an Amazon coupon code Virginia? Or a manufacturer coupon? I don’t know of any way to enter in a manufacturer coupon, but you should be able to enter a coupon code (like from the Parents magazine) without any problem. Hope that makes sense! I read the little message that pops up when you click to cancel your subscription and according to that it will cancel your order that has not shipped. So it looks to me as if you need to wait until your order has shipped before you cancel your subscription. my feb. parents mag. did not have a $10 off coupon! I’m sorry Heidi! I know some people got them and others didn’t but I’m not sure of any rhyme or reason to it. . . it would be so nice if everyone got it! I don’t think it was in the Feb Parents issue, but it was in Baby Talk, Parenting the Early Years, AND Fit Pregnancy. I have noticed that Baby talk has some 20% and some $10, but it seems like all the ones in Fit Pregnancy are $10. I have found them in the mags at HPB before. A trip to Half Price Books for a cheap $1 magazine might be worth it- or you could ask at the counter if you can possibly just tear that out and leave the mag. You never know- they might say ok. I think you might be right about that Stacy – I’ll update. I had it down as Baby Talk or Parents, but think I accidentally had the wrong one – thanks for letting me know! I am trying to order these, but I can not locate the subscribe and save part….I am at checkout and looking in the right sidebar – can’t locate it. Please help!! Hi Julie! It’s in a blue box on the right hand side of the screen; says “Subscribe & Save under “One Time Delivery” . If you still don’t see it try signing up for Amazon Mom first if you’re not seeing it. Hope that helps! By keeping the subscription you will get free shipping – so that issue’s not really an issue (the information on Amazon’s page said that free shipping is included on subscribe & save products). BUT, you are guaranteed a discount on Amazon’s “every day low price”, however you won’t necessarily get today’s low price. (So you could pay more than what you got them for today). Laurie- You are awesome. Thank you so much for the quick reply! Also your answer was very helpful. Thank you so much!!! FYI ~ I have cancelled a Subscribe and Save after it shipped, then went back for the same item down the road and signed up again. The price does fluctuate as most do on Amazon, but it seems like you can subscribe and cancel as many times as you want. Thanks for this! I just got a box of size 4 for $.41 out of pocket… although that was using the Living Social deal from last week and a Swagbucks card. But total out of pocket cost was then $10.41! Awesome! And since we mainly use cloth and these are just for traveling and church nursery they will last us probably that whole 6 months! Hi, I just wanted to say that I’ve been using this deal for about four months and it is awesome. I have two kids in diapers so this really helps. While you get free shipping with each renewal, you only get free 2 day shipping that first time. So I have been canceling my subscription after each shipment and reordering the same item as a new subscription next time. I will say that sometimes the prices fluctuate, but you always have the option to re-activate your subscription at the old price (or at least I was able to once about a mon ago) just go to your account and click on the manage my subscriptions category. Thanks Nicole! I wondered if the price varied when you subscribed, so thanks so much for sharing, also good to know how the free shipping works. Thanks for the information! Thanks again for the heads up on the diapers. My daughter will have 3 in diapers and she has been gathering the coupons from her Drs visits and then I order the diapers for her. I ordered 192 diapers for $15.5 thanks( about 8 cents each!) to the subscribe and save and the 20% off coupon!!! I remembered this post while I was waiting at the doctor’s office twice this week. I managed to find two 20% off diaper coupons, and a $10 coupon! I have more appointments coming up this week, so I’m hoping to find one more $10 coupon to go with the second 20% one. I just got 204 size 3 Luvs for 3 cents each! I just signed up for an amazonmom account and used the subscribe and save. I got a box of 192 ct size 1 diapers for $14 total.I want to put in another order but am not quite clear on why everyone cancels their subscribe and save after each order if they’re going to order regularly? what is the advantage in this?Is it just b/c you lose that first time 15% discount.Can you stack coupons for orders when you subscribe and save? Hi Tiffany! The reason you might want to cancel your subscription, is that the price of diapers through Amazon’s Subscribe & Save may go up (and if you forget to cancel it and miss an email from them, you could potentially pay a higher price for them). What you might consider doing is making a note of when your next shipment should come, and then just watching those Amazon prices. I’ve been watching the prices on Huggies & Pampers at Amazon this month and they’ve stayed exactly the same, however I would hate for the rate to go way up and you be stuck with it! Amazon will send you an email reminder of your next purchase though, so as long as you make sure to watch for those emails you should be fine! You may want to take a minute to read all the info on subscribe & save. Hope that helps! Thanks!! That was really helpful.so,it looks like you can just cancel/resubscribe on subscribe/save as many times as you want then use coupons for each order to get the best discount?I’m just trying to decide if I should just keep doing this for my orders as I plan to continue to buy diapers on a monthly basis and want them cheap.Or,can I get them just as cheap using my regular amazon.com membership and just stacking coupons w/ each order?I like the idea of subscribe/save as you don’t have to worry about putting in an order each month.I hate to keep cancelling/resubscribing to get the deal.Can you add coupon codes to each order before they ship on subscribe/save so you can get each order real cheap?I’m just trying to do this the most convenient cheap way! That’s a great question Tiffany – I don’t know how often the coupon codes become available (I’ve never seen them until the last few months). With other Amazon codes though (like Amazon Swagbuck Gift cards), you can add the code to your account, then let it stay there until you’re ready to use it. So, if you want to keep the subscribe & save, you could continue the subscription and just add codes as they become available. Really, as long as you’re careful to watch to make sure the Amazon prices don’t change drastically, you should get a pretty good deal (without having to stress over finding diaper deals everywhere!) I hope the free codes keep coming out – they’re making for such a great offer from Amazon! It doesn’t look like there is any way that you can add codes for discount on your pending shipments thru subscribe/save. When I view my account after resigning up, it shows my previous orders and sets them up for reshipment again but can’t find a way to enter codes before shipping?